Mystery fiction has many subgenres: hard-boiled, cozy, police procedural, etc. One particular subgenre of interest to lovers of books is that of the bibliomystery. As the name suggests, bibliomysteries are mysteries which deal in some significant way with books and the world associated with books. A bibliomystery may deal with the theft of a rare book, the murder of a bookdealer, or underhanded dealings inside a publishing firm. The key is that the connection to the world of books not be merely tangential. So, a mystery set on a college campus featuring a professor-detective who occasionally wrote wouldn't generally be considered a bibliomystery unless the action of the book somehow centered directly around a book, manuscript, or some other book-related theme. The bibliomystery dates back at least to 1870 when Fredric Perkins' Scrope: or the Lost Library was published. 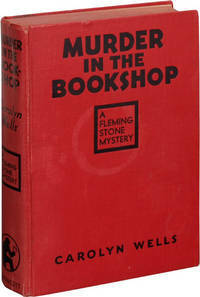 Other early works include Agnes Miller's 1926 The Colfax Book-Plate, in which murders begin after a previously-unknown bookplate is discovered by a bookseller and Carolyn Wells' 1936 Murder in the Bookshop which deals with the disappearance of a $100,000 book. More recently, Robert B. Parker's first Spenser novel The Godwulf Manuscript, dealt with the theft of the titular medieval manuscript and Isaac Asimov wrote Murder at the ABA, about a death at a conference of booksellers. Lawrence Block's "Burglar" series featuring Bernie Rhodenbarr has the gentleman burglar take up bookselling from the third title onwards; some of the books from this series deal more directly with the book world than others. Fast and Loose was a definite bibliomystery, featuring a stolen scrap of a Shakespeare manuscript. Quite possibly the best known recent bibliomystery is John Dunning's Booked to Die (ed. note, see also our blog post revisiting Booked to Die over 20 years later). This 1992 novel introduces Cliff Janeway, a policeman-turned-book-dealer. A book scout's murder leads Janeway deep into the Denver book trade; in the course of the novel, there is much discussion of the collecting of rare books, particularly first editions. The science-fictional Thursday Next series by Jasper Fforde deserves mention for putting a whole new spin on the concept of the "book world" as the titular Jurisfiction agent literally gets Lost In A Good Book. Finally, if you're new to bibliomysteries and don't want to jump in to a full novel the 1995 anthology Murder by the Book would serve well as an introduction to the subgenre. Also worth noting is Fast Company, published in 1937 by Harry Kurnitz, writing as Marco Page. In it, bookseller Joel Glass takes up insurance claim investigations and delves into a case regarding stolen first editions. It was adapted into a 1938 MGM movie starring Melvyn Douglas and Florence Rice as "Thin Man"-esque husband-and-wife Joel and Garda Sloane. Two follow-ups, each with a different lead actor and actress, came out in 1939. "Fast and Loose"" was a definite bibliomystery, featuring a stolen scrap of a Shakespeare manuscript. "Fast and Furious" (directed by none other than musical film legend Busby Berkley) might as well have been called "Joel and Garda Go On Vacation," as it features the book dealers investigating the murder of someone connected to a beauty pageant in Seaside City. All three of these may show up on Turner Classic Movies. Boston's Simmons College has a bibliomystery collection in its library. Their collection and wishlist can be seen at their website. A keyword search for "bibliomystery" on Biblio will turn up books marked by booksellers as being bibliomysteries. Michael Haynes is the proprietor of A Journey Beyond... Books, a former Biblio bookseller.